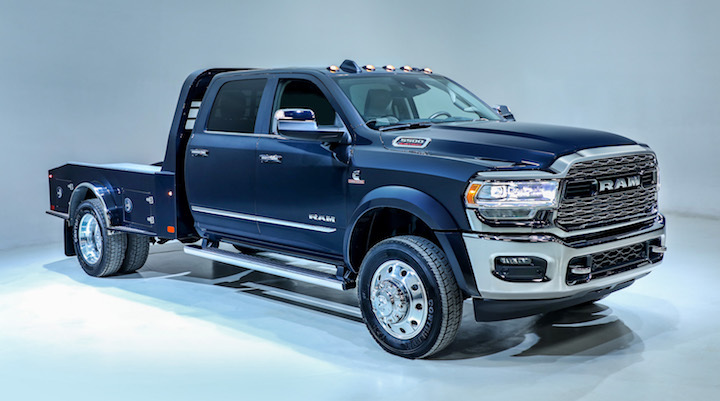 Fiat Chrysler has debuted the 2019 Ram Chassis Cab lineup, which will sit in direct competition to the new 2019 Chevrolet Silverado Medium Duty Chassis Cab. The 2019 Ram Chassis Cab will be offered in 3500, 4500 and 5500 variants, which cover Class 3, 4 and 5 gross vehicle weight ratings. Base models will come with Ram’s 6.4-liter HEMI V8, which is rated at 410 hp and 429 lb-ft of torque. The base transmission is a six-speed Aisin automatic, while a eight-speed auto is offered as an option on the truck for the first time ever. The optional Cummins 6.7-liter inline-six turbodiesel, which is rated at 360 hp and 800 lb-ft of torque, is paired with the Aisin inline-six and cannot be ordered with the eight-speed. Ram says all HEMI V8 3500/4500/5500 Chassis Cab trucks are offered with cylinder deactivation and ‘Deceleration Fuel Shut-Off’, which shuts down certain cylinders when the truck is decelerating. The six-speed automatic transmission also offers an optional Power Take Off that can help safe fuel when accelerating. Properly equipped Cummins diesel 2019 Ram Chassis Cab models have “a segment-leading towing capacity up to 35,220 pounds, the highest Gross Combined Weight Rating of 43,000 pounds and payload up to 12,510 pounds,” the automaker says. Ram claims its chassis cab trucks are also the only trucks in the segment to offer offer adaptive cruise control, Forward Collision Warning, Automatic Emergency Braking (AEB) and AEB with trailer brakes across all trim levels. Available trims include Tradesman, SLT, Laramie and the rather luxurious new Limited. 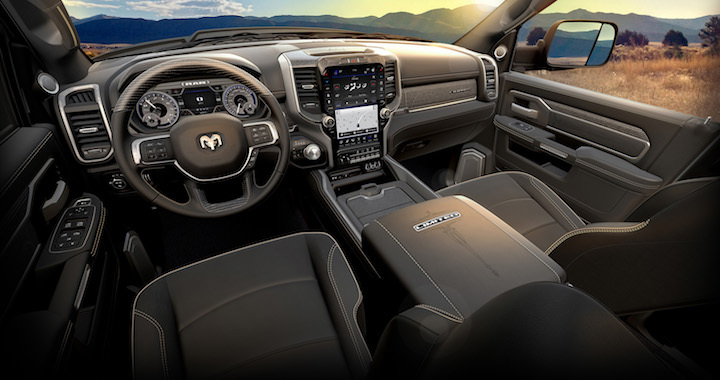 For a work truck, the Limited offers surprisingly high-end features, like Ram’s large 12-inch touchscreen display, leather upholstery and real wood trim. All 2019 Ram Chassis Cab models will be built at the automaker’s Saltillo Truck Assembly Plant in Coahuila, Mexico. Sales are expected to commence in the second quarter of 2019, with pricing to be announced at a later date. For reference, the 2019 Chevrolet Silverado Medium Duty starts at $48,465 for a 4500 HD model. I think they are supposed to move all their HD and Chassis production to Michigan next year after they updated their Warren plant. I have been very happy with the Ram 5500s we have in our towing fleet. It will be interesting how the Silverado will compete and we are considering adding at least two (or the Navistar version) to our fleet. That’s good to hear. GM or not, I like jobs in America. And I do like these trucks too, I’ve always liked Cummins engines and have experience with a wide range of them. I just like the truck that you get with your engine better with a GM. That Dodge is one sweet truck,by far better than the Chinese trucks from Ford or Chevy,Dodge will take a big chunk of the sales this year that’s for sure. Just for the fuel economy alone, think about it ,a company would save thousands each month!! They are built like a tank, so no service BS, look at the Chevy and Ford service bulletins that are out just at this time alone. Good job Dodge keep up the good work!!! A power take off that helps with fuel mileage ? PTO’s are used to power a pump off of the engine through a gear in the transmission. Someone needs to fact check some. Why are specs from the comparable GM medium duty trucks omitted from the article? How does it compare? 35 more ft-lbs when the 6.6 goes into the medium duty Silverado, which i’m sure it will. Its nice to see bailout fiat actually add some class, before you could tell dodge was made by Chrysler. Now that fiat wears the pants, they are starting to pony up the extra cash for decent styling and technology. They know Americans love trucks. Fish in the barrel for fiat.